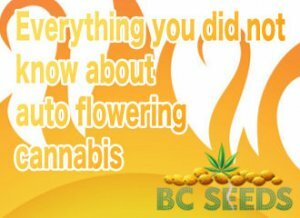 Everything you did not know about auto flowering cannabis. Cannabis plants normally flower according to their exposure to light. Auto-flowering cannabis is when sativa and indica cannabis have genetics from cannabis ruderalis added. Ruderalis automatically flowers between 21 and 30 days. It is a smaller plant so produces less weight per plant and has lower concentrations of THC and other cannabinoids. Crossing ruderalis with indica and sativa produces a plant that does not rely on light periods to flower. The plant starts flowering when it matures. Auto flowering cannabis plants are chosen by growers for many reasons. The most popular reason is to have an early harvest in countries where growing cannabis is illegal. Drug enforcement will use helicopters just before harvest season to find cannabis being grown outdoors. When you grow auto flowering cannabis, you crop will finish and be harvested before the DEA steps foot in their helicopters. Auto flowering cannabis also grow shorter than most cannabis plants. This make it easier to hide small plants scattered around in plain sight and less likely to be detected. Another popular reason to grow from auto weed seeds is again its early harvest times. This is a must for people growing outdoors in cold climates. Growers in Quebec want to avoid the frost, so they often grow auto flowering cannabis outdoors for an August harvest. Seeds have the genetics of the two parent plants and each plant will have different traits. Sometimes the plant will be like its father, or its mother, and sometimes it will have the traits of both parents. This is great for outdoor grows so you get a variety of traits and many different pleasures when you smoke your harvest. Growing sativa crosses in cool countries are the most fun because its often the first time they’ve experienced the effect of a sativa. It’s a completely different buzz than the indica’s typically grown outdoors in the North. It is difficult to grow identical plants from seeds so some breeders choose the best plant to clone. But growing from clones has downsides as the plant will not be as big, strong or vigorous as when grown from seed. When you’re growing on a large scale or if you’re a craft grower, you’ll want to grow from seed every time. You can even try your hands at breeding your own auto flowering feminized strains. So don’t hesitate any longer, try breeding your own ruderalis and sativa genetics. I’m certain you’ll create an amazing strain to smoke.